Editor: It is regrettable to see a wealthy newspaper owner intentionally stir up racial hatred and conflict simply to create controversy and sell newspapers. This was tried before by a publicity seeking columnist, but failed to gain sufficient traction among the come-heres to start racial and cultural warfare and a campaign of persecution against the native Virginians who are still in Loudoun. The historical fact remains that during the War Between the States, the vast majority of Loudoun’s men fought for the Confederacy, and their deaths and other massive sacrifices during that war deserved and still deserve a monument. The fact also remains that these 65 men (and boys) of 1861 fought to defend their county and their state from an already declared Northern invasion already mobilized on their shores. As documented by Northern and Southern historians, the Virginia Secession Convention voted against secession the first time. It was only after President Lincoln’s April 15, 1861, midnight telegram to Virginia Governor Letcher, demanding not only that Virginia furnish 75,000 troops for the invasion of the South, but also that Virginia permit the invading army to march through the commonwealth to suppress the Southern states, that the Convention voted again. That vote was overwhelmingly for secession. As for the claims of 21st century revisionists, these Loudoun soldiers, most of whom had never owned a slave, did not fight to defend slavery. They fought for their families and their very homes. Their monument was erected as soon as it was financially possible here in the war-ravaged and impoverished South. And that is why the attempt to erase and rewrite history as the especially despicable here. I agree. 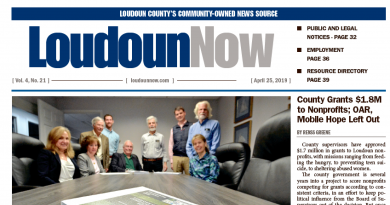 It is sad to see a very racially harmonious Loudoun being peppered by liberal ne’er-do-wells to make political points. This is what is going on here: The intellectually incurious and historically ignorant desperate to contrive some sinister meaning to an object, other than what it actually is. This is the result of having no ideas, no will, and taking the easy way to distract and obfuscate scrutiny of their own failed fringe ideology. These people have no answer to the 15 North traffic quagmire, or the predictable snarls at the toll road and Leesburg bypass, or Scylon road, and 50 other places on our roads. They have no answers to overcrowded schools, or county government’s latest “general plan” scheme where developers rule the roost. They have no solution for criminals living among us, who shouldn’t be in the county in the first place. No ideas for good jobs here in Loudoun, or how to combat the pandemic that is hard drug abuse and government’s collusion in it. They despise expanded freedom for all people, and demand government’s velvet fist to pick winners and losers. So it should be no surprise they attempt distraction from their own failures, and cast blame on an object based in the history of our own county. Revisionism is a hallmark of totalitarians. Actually, those who are practicing “revisionism” on this topic, are those who seem to believe that it is 1859. One does not “honor” traitors. One does not “honor” those who tore this country apart because of a desire to maintain slavery as an acceptable social existence. There is nothing “honorable” about those who, today, give us double-speak, when it is clear what is being advocated. Sorry, but it is not 1859. It is 2017, and we are now able to correct the actions of those in the early 1900s who put up these statues as a form of intimidation. But, it must be understood, that those who can right that wrong, are those in the General Assembly, because it will require a change to our state laws to allow for the relocation of the statue to a more appropriate place – the dump heap. Another democrat trying to erase the unfortunate memories of their past. The next thing Mr. Lawgh will demand is an old fashioned book burning. Revisionists usually follow one with the other.